Gender training is widely seen as necessary for non-gender experts to be able to conduct gender impact analysis and to suggest adequate measures for gender mainstreaming (Council of Europe, 1998). Gender training is also considered key to minimizing the risk of resistance in terms of the implementation of gender equality policies (Halford, 1992). Major training efforts have subsequently been common in connection with gender mainstreaming initiatives. 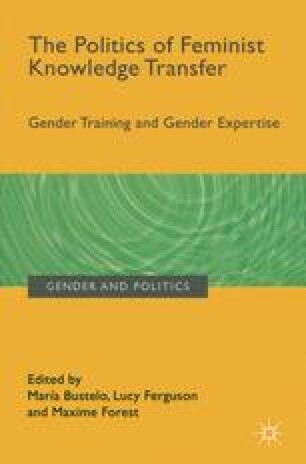 The heavy reliance on gender training as a driver for change in gender mainstreaming strategies, together with reports of difficulties in achieving envisioned policy and organizational changes, raises questions about the potential of gender training as a policy instrument for implementing gender equality policies.